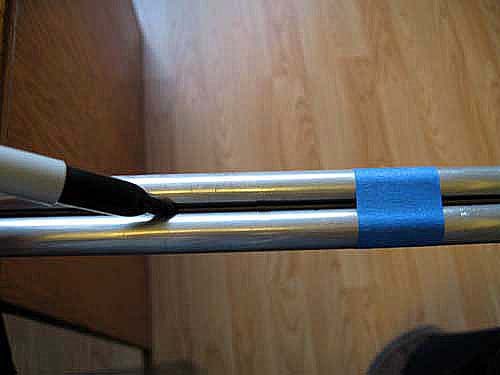 Place the tip of your marker in the joint between the boom and the guide, and mark a line down the entire length of the boom. You will probably need to tape the boom to the guide in several places to prevent the marker from forcing the boom away from the guide. Un-tape the boom from the guide, and rotate the boom to the opposite side using the other locating mark you made at the end of the boom as a reference. Re-tape the boom to the guide and mark a line down this side also. Now that you have both lines drawn, place tick marks on the lines (both sides of the boom) where the holes for the parasitic elements must be drilled, as shown in the picture below. Measure from the end of the boom to each mark to eliminate cumulative errors. Finally, use a center punch to prep the locations (both sides) that will be drilled for the parasitic elements. If you will use 1/8" diameter elements, use a 1/8" drill bit. Drill the holes one side at a time...a common mistake is to drill all the way through the boom in one pass. This will always result in crooked elements unless you are using a drill press, and even then it's difficult to do properly that way.